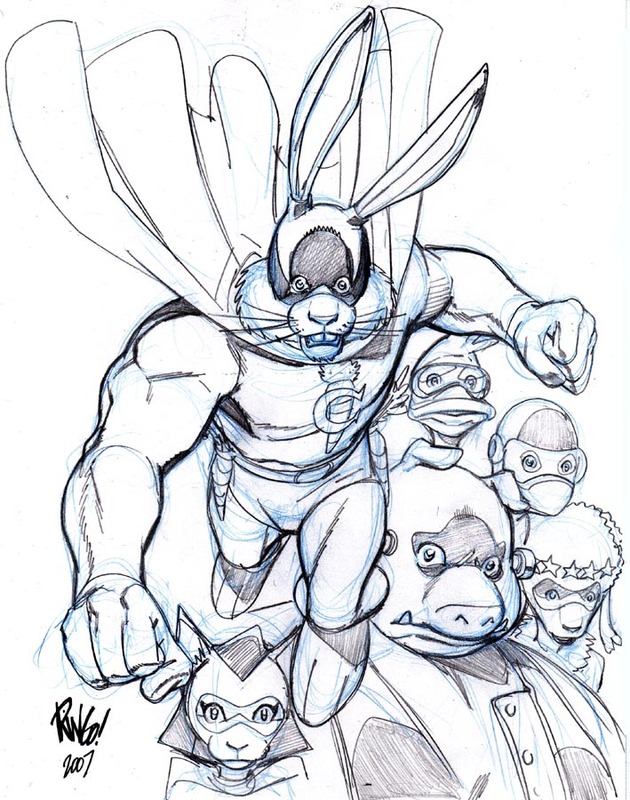 February 2007 - The Official Webpage of Mike Wieringo! archive ¦ The Official Webpage of Mike Wieringo! Over at DRAWINGBOARD.ORG they have a jam thread that’s entitled OH CAPTAIN, MY CAPTAIN which deals with… well, as the title suggests, characters with the word “CAPTAIN” in their name or title. It seemed like as good an opportunity as any to draw the characters from one of my brother’s favorite childhood comics, CAPTAIN CARROT. DC jokes about bringing the character back from time to time– which in this atmosphere of darkness and death at the company is pretty much a long shot…. but it certainly would make Matt’s year if they did. When Matt and I were kids, there were a lot of great comics aimed at a young audience being published. In addition to CAPTAIN CARROT, Matt and I shared an affinity for the HARVEY characters like HOT STUFF, RICHIE RICH and CASPER. Matt loved them more than me… but I dug ’em pretty hard. What were some of your favorite kid’s comic or comics from your youth…? OK… lots to do, so I’m gonna keep it brief. I was up very late last night and my brain’s not working very well this morning… I’m going on almost no sleep. That’s kind of appropriate for todays sketch… because my thoughts FEEL like the kinds of things that BIZARRO might say at this point. I’ve tried to start this post in a half-dozen different ways and had to scrap them all (writing, I mean), simply because I can’t seem to gather my thoughts. I suppose what I WANT to say is that what I like the most about the major iconic characters of both Marvel and DC is (are?) the colorful rogues galleries they have as adversaries. I love the main characters themselves… BATMAN, SUPERMAN, SPIDER-MAN… the FANTASTIC FOUR… but it’s their villains that define them, to a great degree. It’s their villains who add to the tapestry that makes up their individual comic worlds. BIZARRO is one of those great characters. He sort of fell out of favor after the mid-80’s CRISIS ON INFINITE EARTHS mega-crossover. But in recent years, he’s had a resurgence of use in the DCU. 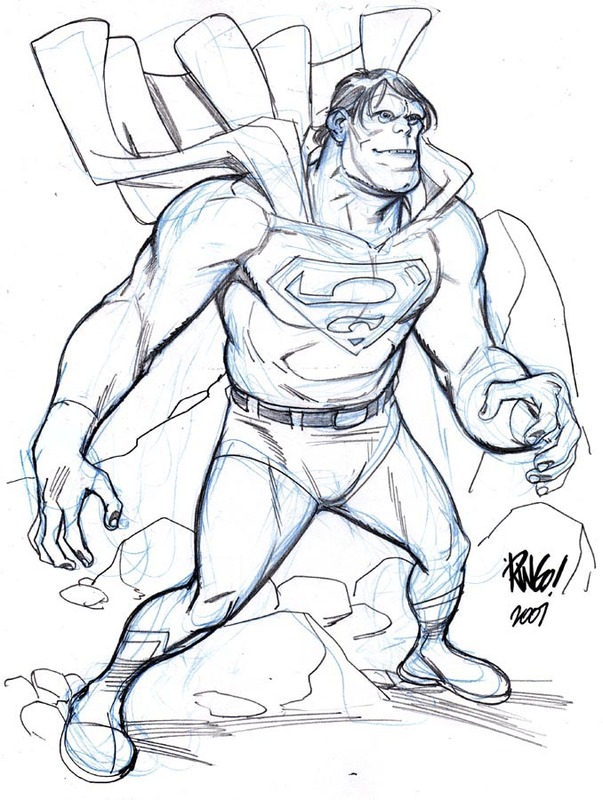 Jeph Loeb and Ed McGuinness used him a lot in their SUPERMAN run… and he was a great addition to the WB animated SUPERMAN cartoon helmed by Bruce Timm. He was even the namesake for the two volumes of BIZARRO COMICS that DC published a couple of years back (some of the best stuff they’ve put out in recent years– by far– IMHO). He’s both funny and tragic at the same time… which is a large part of his appeal; that twisted-mirror image of SUPERMAN, who both idolizes and hates him. He obviously has wide appeal– because I’m always seeing him drawn in posts on such forums as DRAWINGBOARD.ORG (which is pretty much of what prompted me to do this drawing). So– what are some of your favorite bad-guys from your favorite icon’s (or ICONS’) rogues gallery(s)….? OK…. gotta go drink more coffee and try to jump-start my flagging brain…. 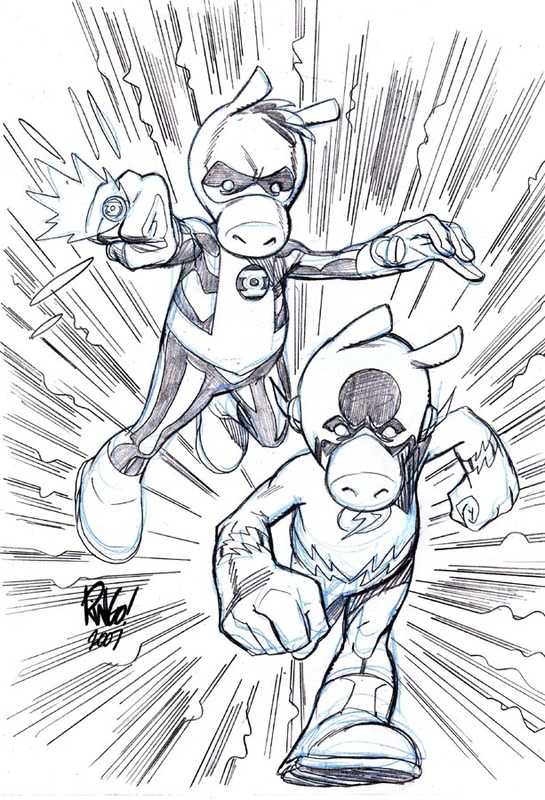 I was still in the mood to draw ‘ham versions’ of DC characters this morning– and so I whipped up GREEN HAMTERN and FLASH-HAM (or would that perhaps be HASH…?). These are fun…. but I could see myself getting bored with them pretty quickly. Not just yet, though. OK… I’m going to have to leave it there. My folks are visiting this weekend, and I’ve got work to do as well as cleaning the house. I hope you all have a great weekend and I hope to see you back here on Monday. I was thinking about how much fun it was to draw the stuff I did in the recent ULTIMATE SPIDER-HAM special. I enjoyed drawing the title character– but it was a real blast to draw the cover with all the ‘hammed out’ versions of the major Marvel characters. Drawing that cover was the most enjoyment from a freelance gig I’ve had in a long time. 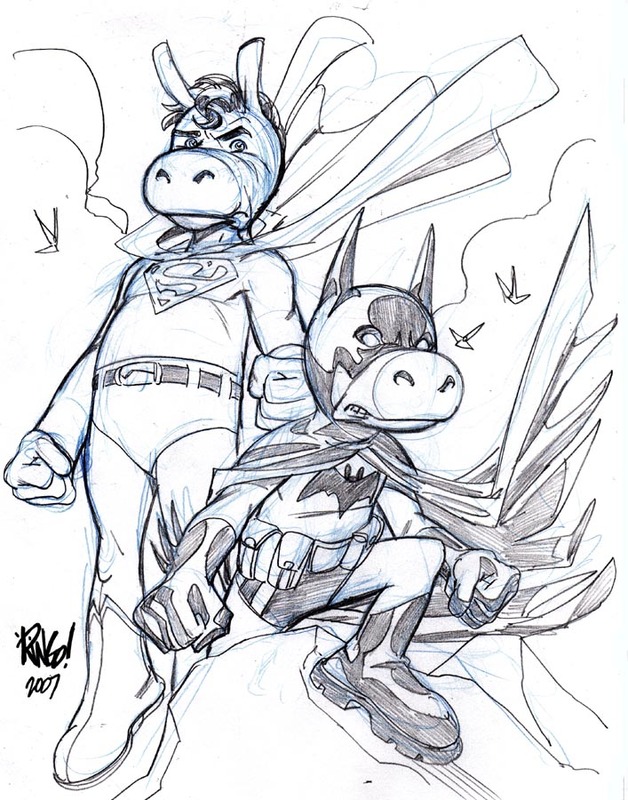 That got me to thinking about how fun it would be to see some of the big DC characters get the same treatment… and so I decided to do today’s WORLD’S SWINEST sketch. Maybe I’ll do more DC folks like this in future posts. OK… gotta keep it quick today. Back when Todd Dezago and I agreed to add TELLOS to the GORILLA COMICS line– teaming up with some mighty amazing creators like Mark Waid, Kurt Busiek, Karl Kesel, Tom Grummett, Stuart Immonen and Barry Kitson– the idea was for each book’s team to come up with 5 page stories to appear in the back of another GORILLA title’s first issue to hopefully cross-pollinate fans with each other. Since Todd and I had already published several issues of TELLOS, we went first… and our 5 pager appeared in the back of Karl Kesel and Tom Grummett’s SECTION ZERO. Todd and I had been talking about a way to introduce stories and bits that not only happen in the ‘present’ of what we were doing in the book at the time, but things that could happen at any point in the history of TELLOS…. both present and future. We wanted to have the ability to be free-form with our creation whenever we wanted. Todd came up with the idea of a ‘storyteller’. He thought it would be a good idea to have a sort of living ‘history book’ of the world of TELLOS… a memory bank, if you will… for everything that had happened in the world’s past– and its future–if we wanted. He wanted to base the character on his late Grandfather on his Mother’s side (her step-father) named Jack Scattergood. And thus SCATTERJACK was born. 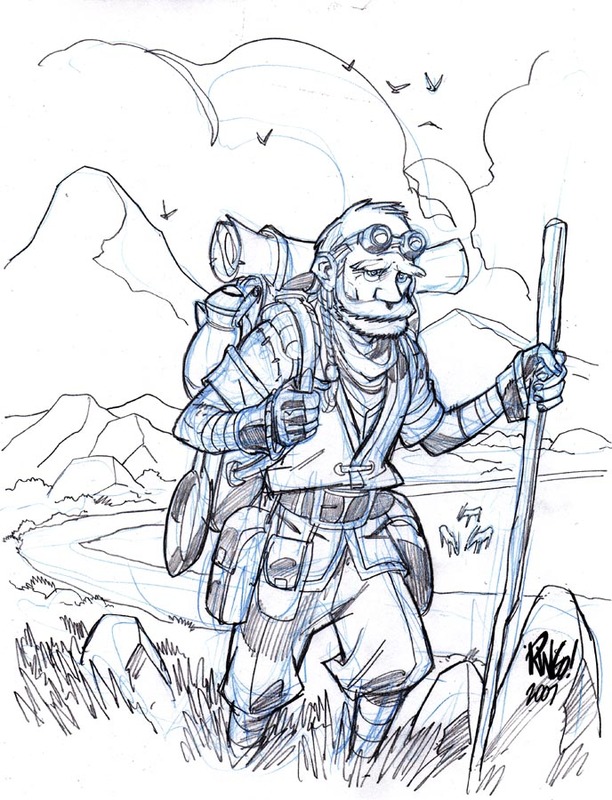 He travels the many lands of TELLOS, trading stories for food and lodging–cataloging and relating the history of that world. OK… enough fond remembering… I’ve got to get to work. You are currently browsing the The Official Webpage of Mike Wieringo! weblog archives for February, 2007.